Hello skaters and welcome back to another year of skating with the CSC! Registration for all programs is now open so make sure to sign up! 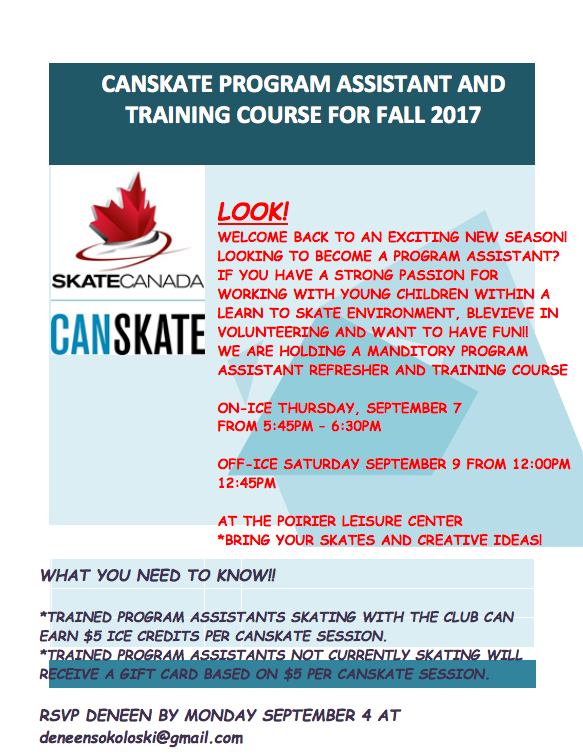 Program Assistants Needed for Canskate! It might be sunny outside, but our fall season on the ice is almost underway! We need Program Assistants for our Canskate program. Being a Program Assistant is a fun way to develop teaching and leadership skills. Please see details below and we hope to see you on the ice! Registration is now open for our Learn-to-Skate and Pre-Powerskate programs for the Spring season! Ice Show Tickets Now On Sale! Registration is now open for off-ice and on-ice sessions during spring bridge season! Registration will close by March 6th, so sign up now to get the sessions you want. Announcing the Coquitlam Skating Club 2017 Ice Show! We hope you can join us on Friday, December 16th from 5:30 - 8:00pm for our Christmas Recital & Family Skate with Santa. Enjoy the special recital featuring many of our groups and soloists starting at 5:30 from the stands. At 6:30 the ice will open up for a family skate with an on ice visit from Santa. There will be food, refreshments and lots of fun! Skate Rentals will be available for guests and family members. Please sign up using the link to RSVP, Sign-up for volunteering and to bring food. This is a GREAT way to fill those volunteer hours (even pot luck items will receive volunteer time credit). We hope to see you next week. Save the date - the CSC Christmas Recital and Party will be on December 16th this year! The event will begin at 3:30 for dress rehearsal and run through the evening. More details to come! Hey figure skaters, Christmas break is fast approaching, which means it is time register for another bridge season. Stay sharp by training over the holiday on our bridge ice December 17th to December 31st. Make sure you sign up early to avoid disappointment! 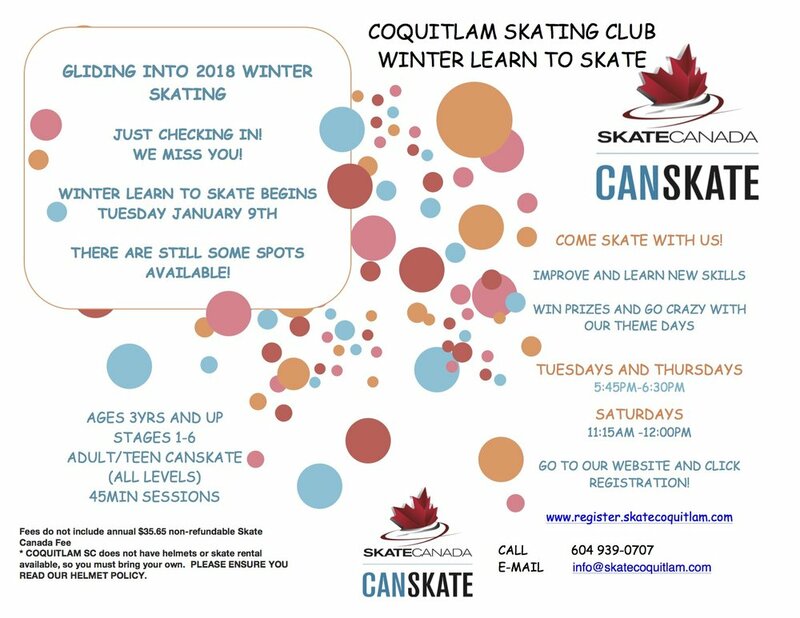 Our next Learn to Skate term begins in January and registration is now open! Visit our Registration Page to sign up now.